A team of researchers from the U.K., France and the U.S. has found evidence that suggests that most of the water on Earth was present before the impact that created the moon. 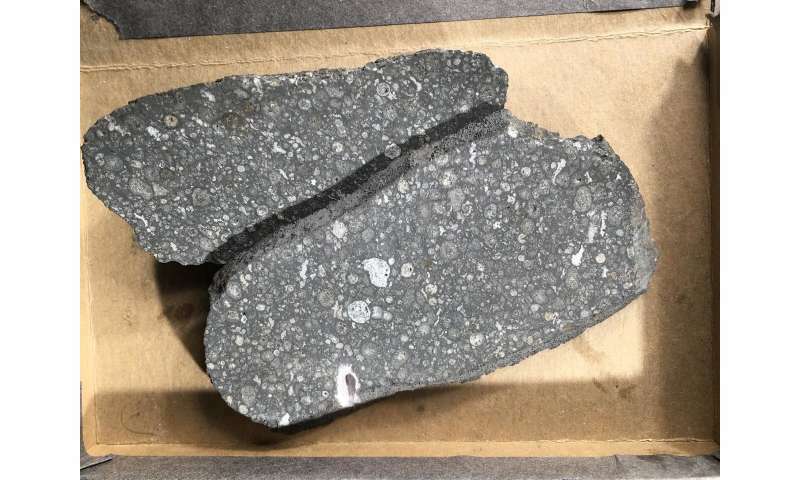 In their paper published on the open access site Science Advances, the group describes their study and comparison of moon and Earth rocks, and what they found. The prevailing theory regarding how the moon's origin is that a Mars-sized protoplanet slammed into protoplanetary Earth, and the ejected material coalesced to form the moon. The prevailing theory regarding how water came to exist on Earth is that most of it was delivered by asteroids and comets. In this new effort, the researchers present evidence that bolsters the first theory but conflicts strongly with the second. The team studied both moon rocks brought back to Earth by the Apollo astronauts and volcanic rocks retrieved by others from the ocean floor. The researchers looked specifically at oxygen isotopes. Studying isotopes in rocks offers scientists a means for comparing material from different origins such as asteroids, planets or even comets—each tends to have its own unique composition signature. The researchers report that oxygen isotopes from the moon and Earth are remarkably similar—they found just a three to four ppm difference between them. This finding bolsters the theory that the moon was formed from material from the Earth due to a collision. But it runs counter to the idea that water came from comets or asteroids, because if it had come from such sources, the isotopes would have differed from those found in rocks on the moon. Thus, most of the water that was present in the protoplanetary Earth likely survived the impact, suggesting it did not come from elsewhere. The idea that water could survive such an impact has implications for the search for life beyond our solar system—exoplanets that are thought to have suffered collisions are typically removed from lists describing possible life-sustaining celestial bodies. Now, they may have to be included. The Earth-Moon system likely formed as a result of a collision between two large planetary objects. Debate about their relative masses, the impact energy involved, and the extent of isotopic homogenization continues. We present the results of a high-precision oxygen isotope study of an extensive suite of lunar and terrestrial samples. We demonstrate that lunar rocks and terrestrial basalts show a 3 to 4 ppm (parts per million), statistically resolvable, difference in Δ17O. Taking aubrite meteorites as a candidate impactor material, we show that the giant impact scenario involved nearly complete mixing between the target and impactor. Alternatively, the degree of similarity between the Δ17O values of the impactor and the proto-Earth must have been significantly closer than that between Earth and aubrites. If the Earth-Moon system evolved from an initially highly vaporized and isotopically homogenized state, as indicated by recent dynamical models, then the terrestrial basalt-lunar oxygen isotope difference detected by our study may be a reflection of post–giant impact additions to Earth. On the basis of this assumption, our data indicate that post–giant impact additions to Earth could have contributed between 5 and 30% of Earth's water, depending on global water estimates. Consequently, our data indicate that the bulk of Earth's water was accreted before the giant impact and not later, as often proposed. This comes as no surprise really. Most of the rocky body accretions in the inner solar system must have been largely finished by the time of this great impact. Bigger question : why this impact occurred. The smaller object spent tens of millions of years forming in its own "zone of accretion", possibly between the orbits of Earth and Venus (or Earth and Mars). Even that is not so significant. Why it did not develop its own stable orbit is the biggest clue perhaps. Since Earth is the only rocky planet with a significant moon, one might think this was a one-off event for the four rocky planets. The giant gas planets, suggested to have formed much closer to the sun before migrating to their current positions, may have perturbed the orbit of this impactor, eventually sending it into the proto-earth. Venus and Earth may have gravitationally "conspired" in this event as an alternative. One also wonders if this impact gave us the tilt in our axis of rotation, and how could we know. It would be more surprising if the Earth did not retain any of its original water. The evidence suggests our solar system started with plenty of water. The high deuterium ratios on Venus and Mars suggest oceans of water originally existed on both of those planets. So there is no reason to think Earth didn't get its fair share too. The Giant Impact would have vaporized and put a lot of that water into space. However, between buried water and water in decaying orbits after the Giant Impact, the fact that 0.02% of our planet's total mass is H2O is hardly surprising, although subsequent comet impacts probably added 5-30% to the total, according to the article above. Except for the fact that an impact didn't cause the creation of the moon, but other than that. Interesting made up story though. Of course it is a made up story. Everybody knows the earth is flat. How could something like that happen to a flat body? But there was something about isotopic ratios from moon rocks that seemed to lock the great impact as the culprit. @Mark Thomas, with his fine knowledge of deuterium ratios, probably can give us a brief on lunar isotopes compared with Earth. ......although subsequent comet impacts probably added 5-30% to the total, according to the article above. Actually, nothing rules out two or more "giant" impacts. If you can have one, you can have more than one. Given this, any discrepancies in isotope ratios might be explained by more than one large impact event, with all involved bodies having somewhat similar isotopes before impact since they likely would have formed in the same general vicinity as the earth at any rate. Recall that there is one major precession superimposed on earth's spin (which is why the "north star" shifts around periodically). It is not unreasonable to assume that the spin and this precession are the result of at least two major strikes by bodies with mass and/or speed sufficient to impart such rotational dynamics to the much larger "survivor" - Earth. Appreciate that the rotational kinetics imparted by such impacts are not strictly related to impacting mass, but also velocity and angle of impact. The amount of orbiting debris would be equally affected by these factors. What's going on with these calls to "scientists"? What makes their awareness distorted is to invent such nebuloses to skip the whole science to man, who would accept this. Imagine that the hen's eggs hit the night's egg and that the eggs of quails came out of here !!! Or, calculate if the radius of the Earth is 6371 km and covered with 3/4 of the surface with a mean water depth of 2 km. Then there would be water about 1.339.10 ^ 15 cubic meters. And that amount would bring some small celestial bodies to the earth. If a diameter of 1 km square is connected to the earth and the water flows 1m / s. it would take about 1,339 billion sec. that water spills on Earth, which is 420 years. Do they know that there are those people whom they can not get so confused. dfjohnsonphd, no worries, it is a good story. There were many competing theories of how the moon was formed when Neil Armstrong took his one small step, but Giant Impact was not one of the top contenders. 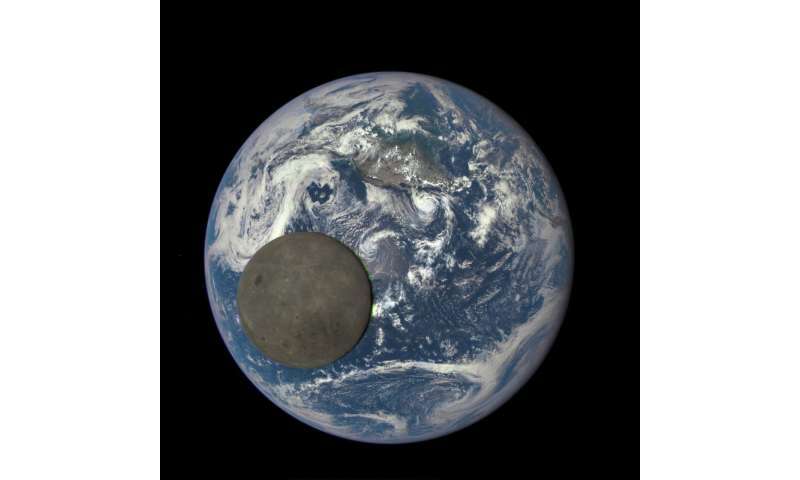 We knew the moon had less density, and inferred a proportionally smaller iron core than Earth, but we needed more evidence to find the best explanation. That crucial missing evidence was on the moon itself. Fortunately, the Apollo astronauts brought back lots of moon rocks to study. Later on it became clear that oxygen isotope ratios for lunar basalts and terrestrial basalts were virtually identical. That made it very likely that the moon formed in the same area as the Earth, but still left the mystery of the smaller iron core. The best answer turned out to be a giant impact that would have ultimately formed the moon out of mostly surface and mantle materials from the impactor and the original Earth. For me, the moral of the story is many of the answers we seek are out there. dfjohnsonphd, regarding my "moral of the story," you can contemplate this as much as you want and I believe will conclude the same thing. There is no substitute for real exploration. If we stop exploring, our society will ultimately stagnate. This truth is painfully clear and simply axiomatic to me, but a large portion of the population would not agree. They would say space exploration is like taking a luxury vacation, nice, but we have more pressing needs at home. Many argue we should solve all our problems on Earth before exploring space. This is a false analogy. Instead of delaying something good like space exploration, why not delay something bad like wars and tax cuts for the wealthy instead? Again, it stands to reason that many of the answers we need are out there. The moon rocks helped to solve a huge mystery, let's see what else we can find. The bottom line is that we can never be certain what more science and knowledge will provide for our future. But we can be certain what the lack of such knowledge will provide: NOTHING! What is the barrage of of comets and asteroids required to deposit all the water the earth contains? Gen 1:9 And God said, Let the waters under the heaven be gathered together unto one place, and let the dry land appear: and it was so. The model seems a bit simplistic, but as a first order model it works. It also plays nice with the recent integration of the entire geological (mostly lunar) record that implies there were no large late bombardment water addition, the impact flow was much as currently (survivable). There was a recent simulation paper that showed inner system exoplanets typically see 0-3 (IIRC) "mantle buster" impacts, making neither Venus nor Earth & Mars atypical. And God created man in Eden, and had second thoughts, so he sent him to another paradise, earth. Fabulous place, filled with life of exceptional beauty and diversity. And Man became Lord over all the earth, and screwed it up BIG TIME. Nice addition, @torbjorn_b_g_larsson. Love the term "mantle busters." Was there any estimate regarding rotational kinetics imparted by such impacts? Just read a theory that earth's precession is due to gravitational yanks of the gas giants and Venus/Mercury. News to me, but as a Biochemist, I have plausible deniability. Also, there may be other slower precessions that we are not yet aware of, which could result in the ice ages. One could have an infinite number of precessions imposed on a spinning body's major axis of rotation (to keep this simple). Had always read that spin, tilt and precession were due to major impacts, and almost certainly mantle busters. And then some spacecraft, a few years back, by parallax analysis, has brought Rigel much closer to us, from ca. 1400 light years to ca. 800. That is a big difference. And the number of galaxies used to 40 billion, now estimated in the trillions. That is a much bigger difference. Hard to keep up with this stuff. The prevailing theory regarding how the moon's origin is that a Mars-sized protoplanet slammed into protoplanetary Earth, and the ejected material coalesced to form the moon. The prevailing theory regarding how water came to exist on Earth is that most of it was delivered by asteroids and comets. Earth was created from water and out of water just as the bible says. There is no other working explanation. Just as another example of the difficulties faced by the attempts at a purely naturalistic formation: Earth has an iron core that simply defies explanation via naturalistic mechanisms, no matter how hard the scientists try to make it fit. The moon and sun was created AFTER the earth was formed - on day 4. This totally flies in the face of the speculative nebular theory of planetary (and I daresay star) formation. There is no satisfactory explanation for the moon's formation either. Too many loose ends.